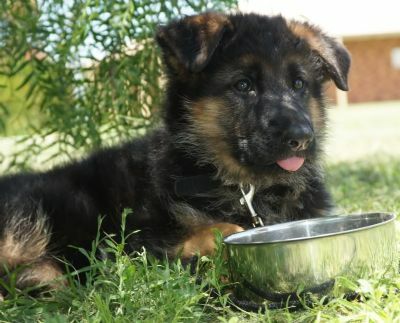 Always make sure your dog has fresh drinking water! Don't ever feed COOKED bones as they can splinter & cause damage to your dogs' digestive system. 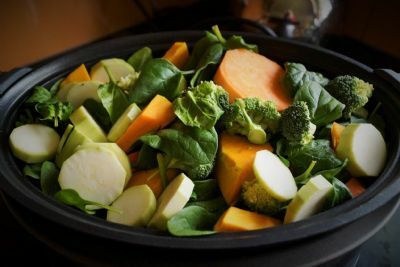 It is important to grind up raw fruit & vegetables to help your dog get the maximum benefits from them. Use a food processor or blender, or alternitively a juicer to separate the fibre & the juice, & simply add the juice to your dogs' food. If feeding offal or organ meat (which is very rich) & best not feed more than once or twice weekly. If you are concerned about upsetting the dogs' tummy, freeze the food then thaw completely before feeding it to your dog. yogurt - make sure to only choose yogurts that do not contain artificial sweeteners or added sugars. Yogurt with active bacteria can act as a probiotic and are good for your dog’s digestive system. Golden Paste - Dosage ¼ teaspoon for every 4.5kg of your dog's body weight - Start out with about one quarter to one half teaspoon depending how big your dog is. 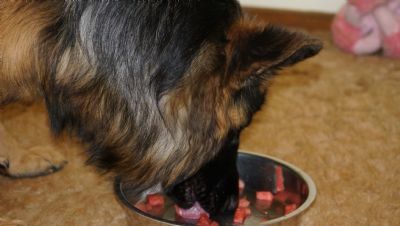 Use as a guide: the dosage for larger dogs is roughly one tablespoon daily. They say the body expels turmeric quickly; so with that in mind, you should split the dosage between two meals. The amount of Formula fed is only an estimation - your dog should ALWAYS have a waistline. Feed your dog the same amount you have been feeding from 9 to 12 months unless he is not showing a waistline then cut the amount of food you are giving him or up his exercise regime. What you have fed your dog from the age of 12 months should be all he requires as an adult. If at any stage the dog does not have a waistline, reduce the the meal size and increase the exercise. REMEMBER - If your dog is too fat - YOU are not getting enough exercise.